On the agenda this morning: a three-hour sea kayaking tour with Cap Aventure to watch seals in the Gaspé Bay. I head for the meeting point, located less than 500 metres away from Auberge Internationale Forillon. During high season, tours depart from the Grande-Grave wharf, in Forillon National Park. Once all the participants have arrived, Serge, the owner of Cap Aventure, gives us some safety instructions as well as a quick lesson on efficient paddling and on the proper adjustment of pedals and footrests to ensure our comfort in the boat. We are eleven guests and there are two guides with us; Serge will be in a single kayak and Marc-André in a double kayak with a young guest. And off we go! Even if the sky is cloudy, the weather is nice, there’s virtually no wind and the sea is very quiet. First thing that surprises me: the water is warm. I’m told that its temperature reached 20 degrees this summer. Serge points towards the seal haul-out, our destination. He says that grey seals and harbour seals are found in the bay and that their population is estimated at some 600 individuals when we combine both species. The surroundings are awesome. We paddle by sandstone cliffs and enjoy a beautiful view of the south side of the bay. We see our first seals of the day in the distance, little heads popping out of the water with their typical curious look. We get to the haul-out. Second thing that surprises me: the number of seals. All along the shore, dozens of harbour seals rest on rocks. We keep a safe distance to avoid scaring them and rushing them back to the water. Some of them, already in the water come by to see us. And believe me, they come real close. One of them actually gets close enough to smell the end toggle of Serge’s kayak. Another one pops out less than a foot away from our boat. He’s too quick for me; I can’t get my camera out before he dives back underwater. Note to self for next time: keep the camera close-by. 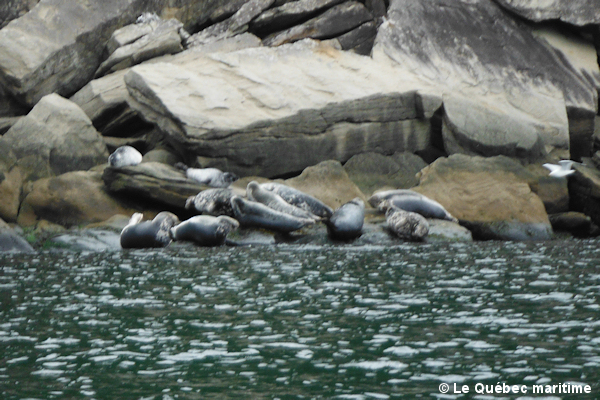 We continue along the shore and get to a group of grey seals, which are much bigger than harbour seals. Serge explains us that, unlike harbour seals that spend the whole year in Gaspé Bay, grey seals spend the winter on Sable Island, off the coast of Nova Scotia, and migrate back here in June. As they arrive in Gaspé Bay, they literally push the harbour seals off the largest (and best) rocks for their own use. That’s the law of the jungle! Third thing that surprises me: the sound. Grey seals have a really special howling, similar to that of wolves. You really got to hear it to believe it! After turning around to get back at the launching site, we can see the city of Gaspé in front of us at the head of the bay, surrounded by mountains, in a unique setting. So picturesque! While passing by the haul-out on our way back, we see many seal pups, still with a whitish fur. One of them is lying on his side, moving his flipper as if he’s waving us goodbye. What a cute way to end our beautiful tour on the water! 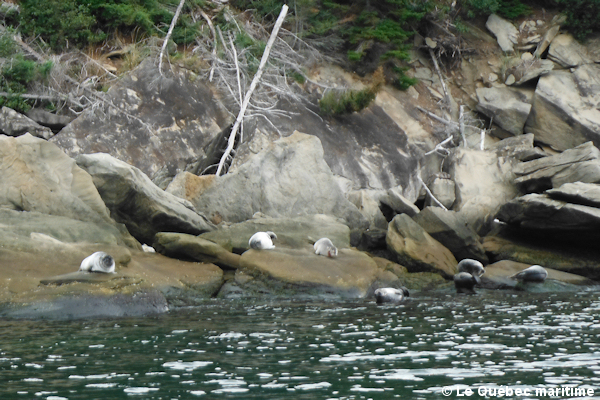 Besides the seal-watching tour, Cap Aventure offers longer kayaking tours in Gaspé Bay as well as sunset tours. Whatever tour you chose, I strongly recommend you to try out this great experience which is accessible to everyone. I’m sure you will be as amazed as I was!